LES VAMPIRES (1915–16) is a mystery. It is justly famous, yet relatively rarely watched. Its imagery is iconic, but misleading: the famous image of a female vampire bat preying on a victim involves none of the main characters, and the serial features no mythological vampires. It is commonly classed as one of the longest films in the world, at around seven hours long, but this, too, is a misunderstanding given its serialised release, with ten episodes over nine screenings. Finally, while LES VAMPIRES was a contemporary success its reels narrowly avoided being destroyed in the 1930s, and the film wasn’t distributed in English-speaking countries until 1965. So, like many modern viewers, I came to LES VAMPIRES with uncertain expectations. 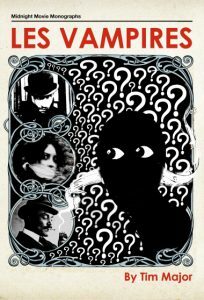 What I knew of the serial had been gleaned from stills in cinema history books, and from that terrific promotional poster image showing Musidora / Irma Vep entangled in a red question mark. I’d become interested in Victorian and fin-de-siècle crime fiction about rogues and gentlemen-thieves, progressing from E. W. Hornung’s A. J. Raffles, to Maurice Leblanc’s Arsène Lupin, to Marcel Allain’s and Pierre Souvestre’s Fantômas. This in turn led me to Louis Feuillade’s first great crime serial, FANTÔMAS (1913). But it was within Oliver Assayas’ lively, strange film IRMA VEP (1996), about a French director unsuccessfully attempting to remake LES VAMPIRES, that I first saw a snippet of the serial itself. The fictional director, played by Jean-Pierre Léaud, demonstrates the magnificence of LES VAMPIRES and its greatest asset, the criminal Irma Vep played by Musidora, by screening a clip from Episode 6, ‘The Hypnotic Gaze’. Maggie Cheung, playing herself, is suitably impressed – and I was stunned. I was determined to watch LES VAMPIRES at the first opportunity. Rather than consuming the serial in one go (see my earlier point about the length of the film – who would want to? ), I worked through it in fits and starts. I watched episodes late at night, often the same episode twice in one sitting. I watched them early in the morning with my newborn first child. I packed DVDs to watch on hotel TVs when I worked away from home. I treated each new episode as a gift to myself, to be withheld and then savoured. Filmmakers and critics often talk of the ‘journey’ experienced by film audiences, but over seven hours the journey – and the relationship with characters – is more profound. Moreover, the tone of LES VAMPIRES takes a few episodes to ‘bed in’, after which point its tangents and about-faces become less jarring and more welcome. The viewer is trained, gradually, to watch the serial and anticipate its internal logic. Since watching the serial for the first time, I see its influence in more and more unlikely places. The hotel setting of Ingmar Bergman’s masterful THE SILENCE (1963) evokes the hotel in ‘The Hypnotic Gaze’, with its corridors that twist back on themselves, the deserted streets outside. Jacques Rivette’s CELINE AND JULIE GO BOATING (1974) not only features its leads wearing replicas of Musidora’s silk bodysuit, but also adopts Feuillade’s dreamlike tone and circuitousness. David Lynch’s TWIN PEAKS: THE RETURN (2017) retains the episodic structure of LES VAMPIRES and also its obliqueness and the requirement of surrendering to its woozy logic. I’ve watched LES VAMPIRES in its entirety countless times while writing this book, and I’m happy to report that it only improves with multiple viewings. It remains equally magical whether monochrome or tinted, whether accompanied by an orchestral score or a soundtrack of, for example, Porter Ricks’ Biokinetics, whether viewed on a widescreen TV or relegated to a window within a laptop screen (though I can only imagine the amplification of its magic when projected onto a cinema screen). I think, perhaps, LES VAMPIRES may have become my favourite film. If nothing else, I hope that my enthusiasm for it is infectious. One of them was written many years ago, though, and references a different film, in a nod to Feuillade’s incorporation of unrelated, previously-filmed material.